10 Breathtaking Sunsets on Cape Cod...a summer finale! Here are the best spots where you can catch the summer sunset finale. Now, you just need to make your plan on where to stay AFTER! We still have rooms available this Labor Day weekend at the Cape Codder Resort & Spa AND we're conveniently located close to spectacular sunsets, fun-filled attractions, great shopping and more! Located just down the street from the Cape Codder Resort , this quaint harbor has a beach at the end of the street as well. Watch as the boats turn into silhouettes against the fiery sky. One of the mid-Cape's most popular beaches, stroll through the soft surf and take in the view over Nantucket Sound. Watching the blazing sun sink into the tranquil water of Cape Cod Bay is simply beyond words. Stay in your car, stroll the harbor or sink your toes into the flats, Rock Harbor affords incredible views no matter your vantage point! Just a short distance from Main Street, Falmouth and from the lighthouse, visitors can look across to Martha's Vineyard on a clear day. You can't find a better sunset as you are at the "end of the land" - the very tip of Cape Cod! Just a few minutes from our Dan'l Webster Inn, the sun sets down into the Canal...a truly unique view, putting into perspective your Cape Cod location. 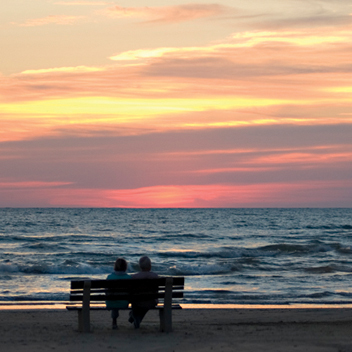 Relax and stroll along the boardwalk as the sun sets, then sit and enjoy the view from the deck. Climb to the top of Scargo Tower for a unique panorama overlooking the beautiful town of Dennis. The site of the real "first encounter" between the Pilgrims and the native Indians. This beach is fraught with history and a stunning setting to take in the sunset.